Last week, when the Toronto Maple Leafs opened training camp in Nova Scotia, both new coach Mike Babcock and new GM Lou Lamoriello talked about a “clean slate,” meaning they would have no preconceived notions on players based on last year’s woeful Leafs season. It’s probably just a coincidence, but that certainly seemed apropos for the week between Rosh Hashanah and Yom Kippur. Among the many question marks for the Leafs heading into the season is (once again) who’s going to be the number-one goalie. “I like one guy to know he’s the guy,” said Babcock. “Someone’s gotta grab it.” He’s apparently prepared to let James Reimer and Jonathan Bernier fight it out. 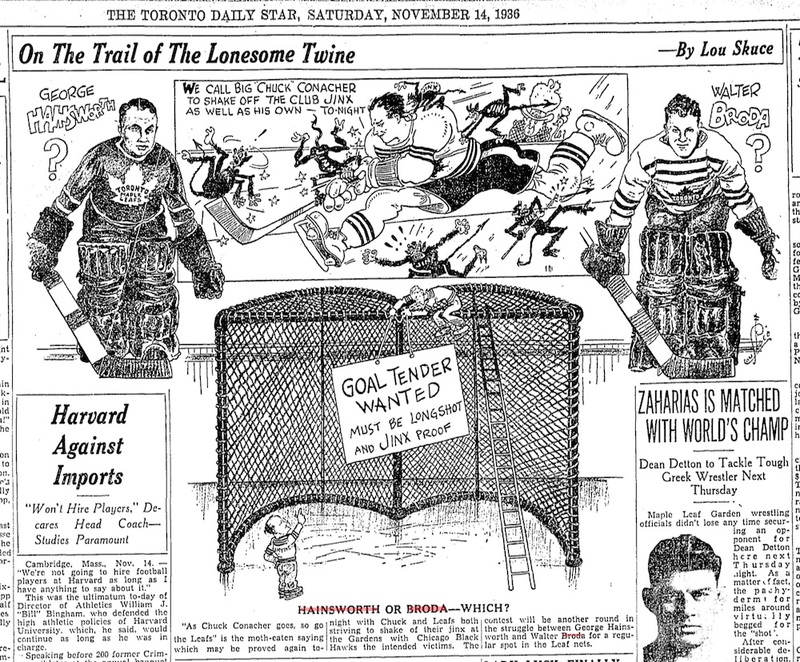 Bernier and Reimer both have their supporters among Toronto fans … but it’s not exactly like the Leafs are battling with the embarrassment of riches they faced at training camp back in the fall of 1936. George Hainsworth was a 41-year-old veteran who’d had his best years with the Montreal Canadiens in the late 1920s, but had certainly been solid during his three seasons in Toronto. He helped the Maple Leafs win three straight Canadian Division titles from 1933-34 to 1935-36 and make two appearances in the Stanley Cup Final. 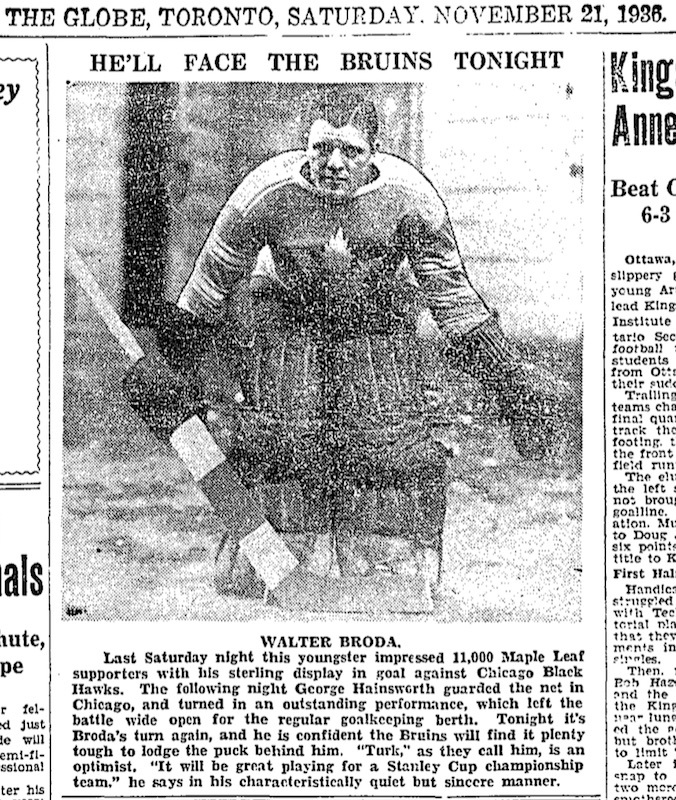 Turk Broda was a 22-year-old whom the Leafs had purchased from the Red Wings for $8,000 the previous spring – an unheard of sum for a raw rookie with no NHL experience during The Great Depression. It didn’t take long for the Leafs to make a decision. On November 25, Smythe announced that Hainsworth had been released outright. Turned out to be the right move. Hainsworth was all but done, whereas Broda would become the winningest goalie in franchise history with 302 regular-season victories, and five Stanley Cup championships. But hey, it’s still baseball season and the Blue Jays are in a pennant race! The Yankees kept things interesting this week … just as they did back in 1985. Yogi Berra – who passed away on Tuesday at the age of 90 – briefly served as Yankees manager that season. (And all season in 1984.) Though I did see him around Exhibition Stadium during my ground crew days, I have no personal memories to share. 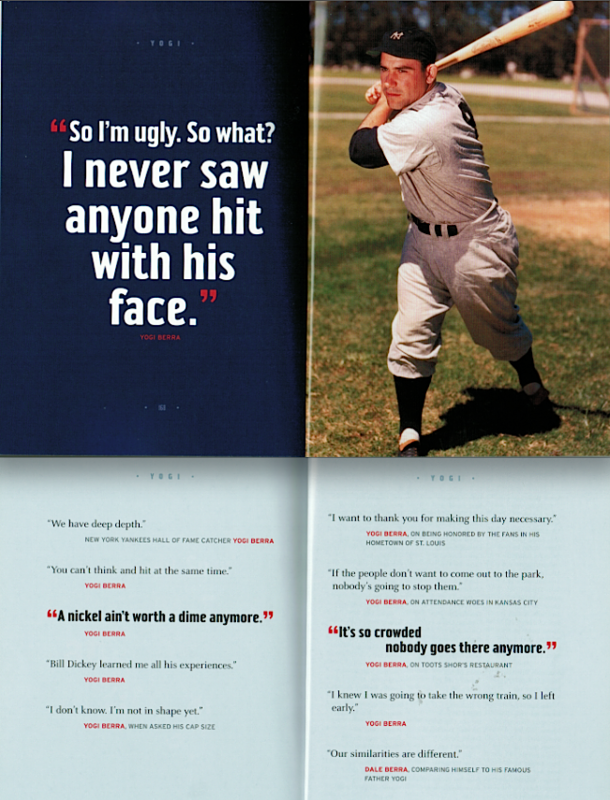 However, please enjoy these Yogi Berra-isms from my 2006 quote book for Firefly Books, Home Plate Don’t Move. And remember a 3-1/2 game lead is great, but it isn’t over til it’s over! Good-bye Yogi Berra! Altho I did not watch a lot of baseball (shame on me) I liked to watch him many years ago…. I think it was his name….I might have thought he was related to a certain cartoon Bear! All kidding aside he was a real Mensch! !